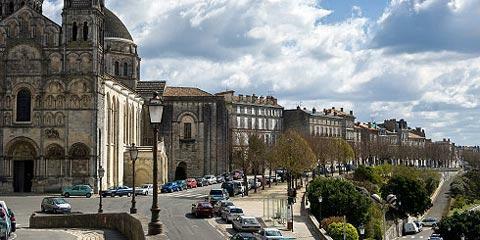 Angouleme is 130 kilometres north-east of Bordeaux, in the Charente department of Poitou-Charentes. 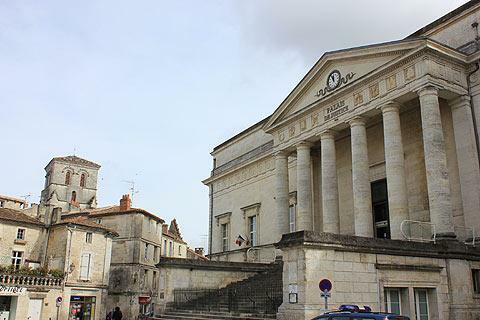 Standing on a rocky promontory, the town overlooks the Charente River and Angouleme is surrounded by large boulevards which stand above the original ramparts that protected the town. Around the heart of Angouleme historic centre (which is classified among the French Towns of Art and History) there are more than two kilometres of the ramparts remaining intact, while the boulevards that follow the walls are wide, open streets with good views across the surrounding countryside. 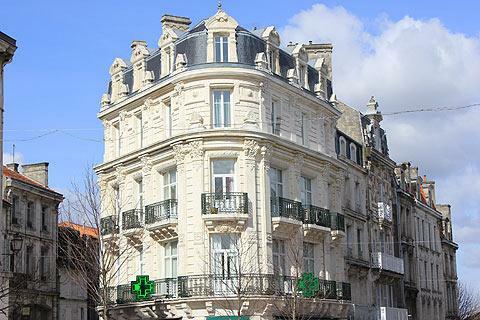 Start your visit at Angouleme Tourist Office towards the east of the centre and near the 19th century market halls, a good example of the iron and glass buildings of the period. 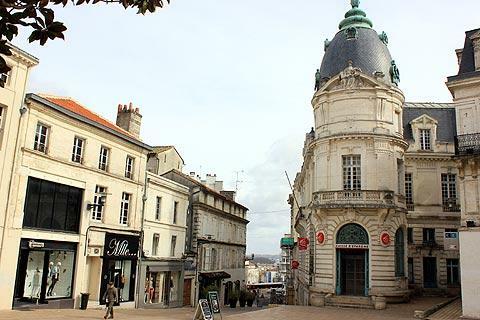 From here you can head into the town centre and the Town Hall, one of the most important monuments in Angouleme. 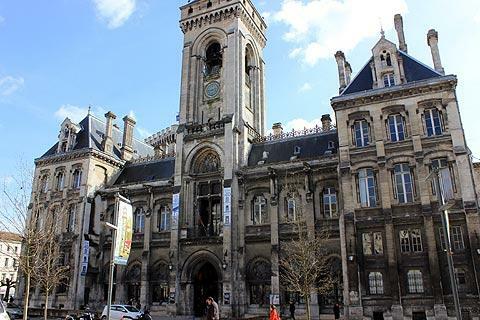 The Town Hall was built on the site of an earlier chateau, of which just two towers now remain and are incorporated into the Town Hall building. The towers date from the 13th and 15th centuries, while the remainder of the building was constructed in the 19th century. The other side of the square in front of the Town hall you can see the elegant facade of the Hotel Saint-Simon, a 16th century townhouse with an ornately decorated facade. Close by you can see the neo-classical style Palace of Justice and the Church of Saint-Andre. The church was originally built in the 12th century although substantial additions are in the later gothic style and the facade dates from a 19th century reconstruction. Near the church take a look at the curious 'lanterne des morts'. The Theatre, on the southern side of the Place New York, has a decorative facade and was also built in the 19th century. Heading along the ramparts on the southern side of the centre you will reach the cathedral. 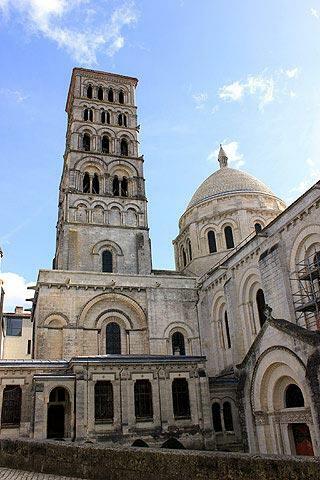 The Romanesque Cathedral of Saint Pierre dates back 900 years but has been altered a great deal since. It is the ornately decorated facade that holds the most interest, with 70 carvings depicting the story of the Ascension and the Final Judgement. Following the crusades the magnificent domed churches of Constantinople and Eastern Europe had a marked affect on the architecture of some churches. St Marks Basilica in Venice is a particularly good example of this eastern influence but in this area of France both Saint Pierre's cathedral in Angouleme and Saint-Front cathedral in Perigueux, with their beautiful domed roofs, are good examples of the Byzantine influence. Continuing westwards the Chapel of the Cordeliers is part of what was once an important monastic settlement here - you can also see traces of the cloisters. Elsewhere in the town you will come across lots of other interesting buildings such as churches and chapels and several grand townhouses, and a good number of shops and cafes in the open squares and the pedestrianised streets. A nice way to continue your tour of the centre of Angouleme is to continue via Place Beaulieu, with its far-reaching views across the town and river, then take a stroll through the extensive park under the ramparts to the west, which also includes various sculptures, water features and an animal park, then follow your way back through the town, along the ramparts to the north and through the streets around the Place du Minage, where you can see several interesting townhouses. There are also several museums in the town, including a Museum of Fine Arts and an Archaeology Museum. 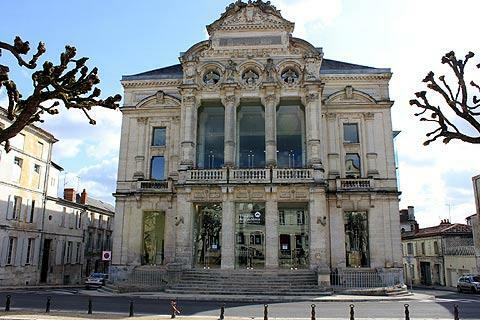 These are grouped together as the Museum of Angouleme in the town centre. Down by the river you can visit the Museum of Paper (the wealth of Angouleme was based on the paper industry), and also the Museum of Comic Books. 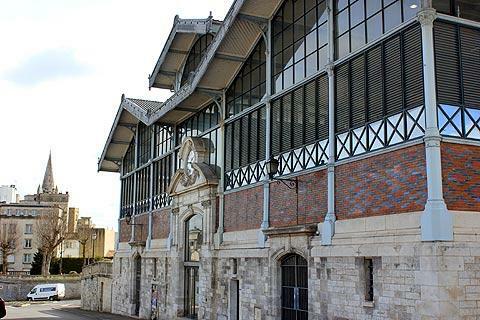 The high point in the calendar of Angouleme is the International Comic festival that is held in the town each January. 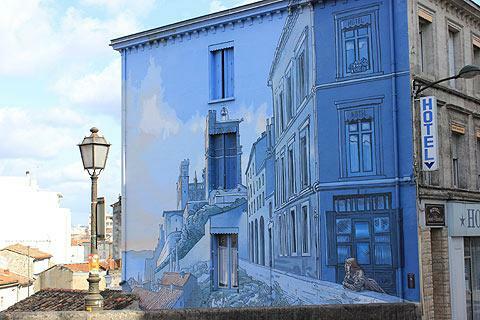 This important event also explains why you will sometimes come across walls painted in cartoon or trompe l'oeil style as you explore the town. The focus of this popular event is the group of buildings near the Paper Museum. Every September Angouleme's roads becomes a race track and vintage cars from far and wide come to race in this wonderful race that first took place in 1939. The event starts on the Friday with a big parade of all the contestents, the 'Concours d'Elegance', giving you the chance to admire up close these classic cars. On the Saturday anyone with a pre-1975 car can take part in the Tourist Rally through the local countryside and then the big race takes part on Sunday. The townsfolks and visitors sit on top of the remparts and enjoy the race taking place below. See Angouleme Circuit des Ramparts for a guest article describing the event. 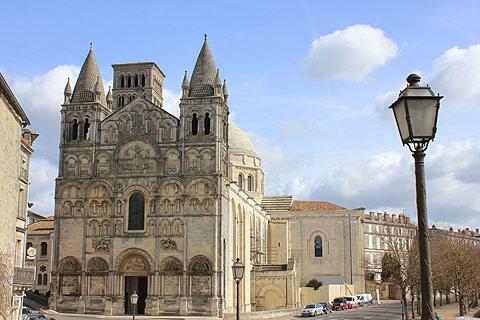 After exploring the old town in Angouleme, complete your visit with a stroll along the banks of the Charente, or with a boat trip to see more of the picturesque scenery along the river. 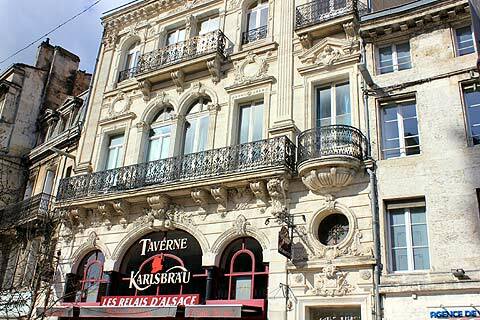 Further afield there are various Charentais towns and villages to explore. Many of the villages have well maintained roman style churches, while our favourite town near Angouleme is Cognac to the west.